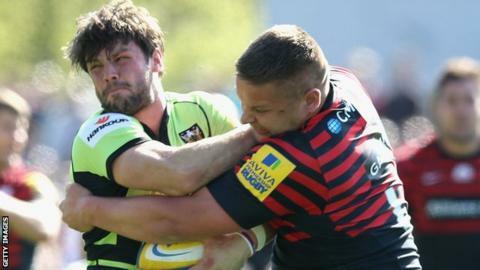 Northampton director of rugby Jim Mallinder says he is not worried about his side's form going into the battle for a Premiership home semi-final. Saints suffered a third straight league defeat on Sunday, losing to Saracens, and conceded ground to third-placed Leicester in the race for second. "We're not too concerned about it," said Mallinder. "It's interesting isn't it? We're three points clear with three to go. Cracking. It's all in our hands." Leicester's victory over London Wasps moved them to within two points of Saints, who then went on to pick up a losing bonus point at Allianz Park. Mallinder's side beat Sale last week to progress to an Amlin Challenge Cup semi-final, but their league form has dipped since a 13-game unbeaten run in the competition came to an end last month. "I think we played pretty well last week. We changed the team a little bit this week but we're not playing as well as what we did before and during the Six Nations," said Mallinder. "We came away to Sarries who are top of the league and are a good side and we played into their hands a bit. "I've said to the boys if we win with a bonus point in all of our remaining games then we've got a home semi. It's exciting and we're looking forward to it. "First of all you have to get into the play-offs and then you want that momentum and to be playing well. "You want to be firing going into the semi and then hopefully a final."